Halloween is a time for a celebration of everything horror! You know the scoop, queue up those scary movies on the TV, decorate your home with gory zombies, dress up like your favorite vampire, and scare a few kids along the way! But why stop there? You can take it a whole step further. How? Well, you can get your keys involved in the Halloween spirit just by using this delightfully creepy Bloody Lanyard accessory. 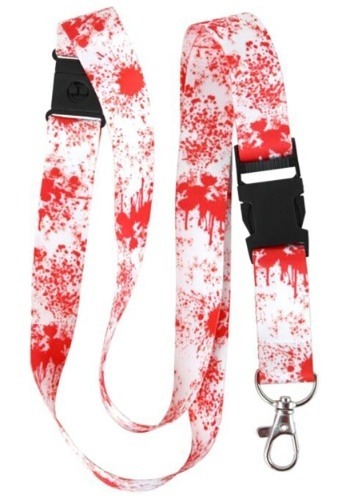 The lanyard has a uniquely horrifying design, complete with a "blood-soaked" ribbon that goes around your neck. The bottom comes with a D-ring and a metal clip that can hold all of your keys. It also comes with a quick-release clasp, so you can quickly access your keys with the lanyard still around your neck. You can even toss an ID badge on the lanyard if you're headed to a horror film convention! So, who exactly is this lanyard for? It's for those who love their horror movies. It's for anyone who plans on dressing up like a zombie this year. It's for anyone who's trying to dress up like the victim of a zombie. But most importantly, it's for anyone who just needs a good place to place their keys this Halloween!